rice balls in Boston, I starting searching for a good recipe to make them. Although this one might be a little more extravagant than others, it’s also very, very good. I didn’t use grapeseed or safflower oil (just canola), and because pomegranates are out of season now, I put in small dollops of black current jam. I think lingonberry jam would also be terrific, as would probably raspberry or any other favorite. I did use fontina cheese, and it was great–melted perfectly and was delicious. But, if you’re wanting something a little more budget-friendly, cubes of mozzerella would also be good, I think (just not fresh mozz). Cubes of ham would also be good, if you wanted. Also, the recipe doesn’t specify how much salt to add, but it needs quite a bit. Definitely taste the rice mixture before refrigerating it, and add according (1 t. + more according to taste). And note the yield: it makes a lot. I refrigerated the rice mixture for a couple of days and it held up well in an airtight container. Heat grapeseed oil in a medium saucepan over medium heat. Add onion, and cook until soft and translucent, about 7 minutes. Add rice, and toast, stirring often, for 2 minutes. Remove from heat. Add wine. Heat over medium-high heat, and cook, stirring constantly, until wine has reduced by half, about 3 minutes. Add 2 cups water and the rosemary. Cook, stirring constantly and adding 2 cups water at a time, plus more if needed, waiting for each addition to be absorbed before adding the next, until rice is al dente, about 20 minutes more. Discard rosemary sprigs. Add Parmesan and butter, and season with salt and pepper. (Mixture will loosely hold its shape.) Transfer to a baking sheet, and refrigerate until cooled, about 2 hours or overnight. Transfer rice to a bowl, and stir in fontina and pomegranate seeds. Form into 1 3/4-inch balls, and transfer to a clean baking sheet. Place breadcrumbs on a plate. Roll each ball in breadcrumbs to coat, then in egg mixture, then again in breadcrumbs, returning to baking sheet as you work. Heat 4 inches safflower oil in a medium pot until a deep-fry thermometer reaches 350 degrees. 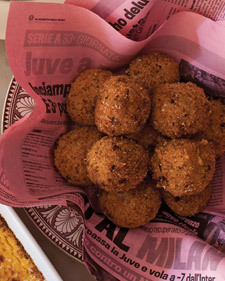 Working in batches, carefully drop rice balls into oil, and fry until golden, about 2 1/2 minutes. Transfer to paper towel-lined plates to drain. Sprinkle with salt.